Comhaltas Ceoltóirí Éireann Tour. 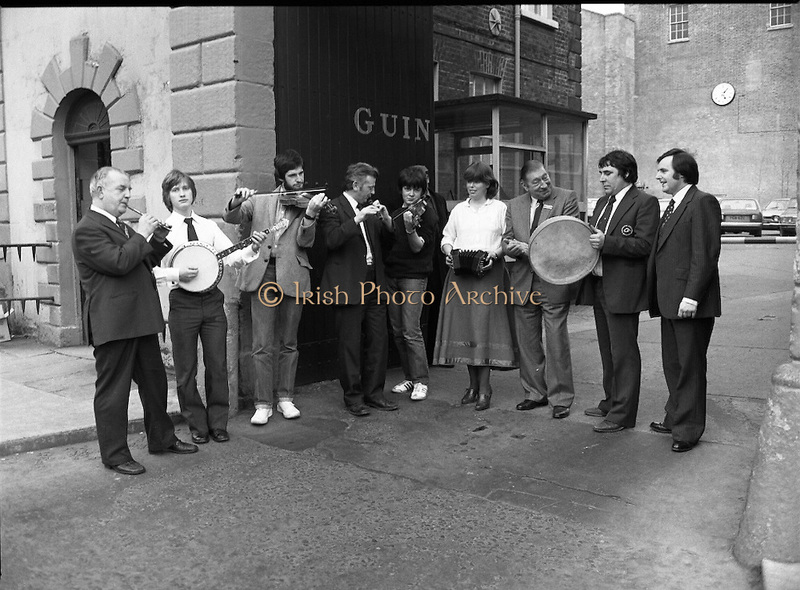 (N66)..1981..24.03.1981..03.24.1981..24th March 1981..Twenty leading traditional musicians, singers and dancers will participatein the third annualconcert tour of Ireland by Comhaltas Ceoltóirí Éireann.The tour which will cover the four provinces will be from March 29th to April 12th. Due to the rising costs of such a tour Comhaltas appealed for sponsorship, Guinness Group Sales,Ltd, responded generously and have adopted the Irish Tour as their special project..The artistes appearing include;. Bobby Gardiner,Clare; Sean McSkeane,London;.Liam Farrell,London; Frank Kelly, Donegal;.Vincent Broderick, Galway; Anne McAuliffe, Kerry;.Margaret Peakin, Liverpool; Peter Carberry,Longford;.Nora Butler, Tipperary; Michael Hipkiss, Bimingham;.Maria Wogan, Dublin; Anne Callaghan, Tipperary;.Michael Cunningham and John Cunningham, Athlone...Pictured at Guinness Brewery, St James's Gate Dublin were: (L-R) Vincent Broderick,Mícheal Ó Cionnaith,Séamus Glacken,Kevin Glacken,Mary McNamara, Mr Norman Cairns, Managing Director,Guinness Group Sales,Seán MacTurlough and Donal DeBarra,president of Comhaltas.